Here's how our Snow Boss looked this morning when big flakes were falling fast. A few minutes later, he ran off bucking and snorting. 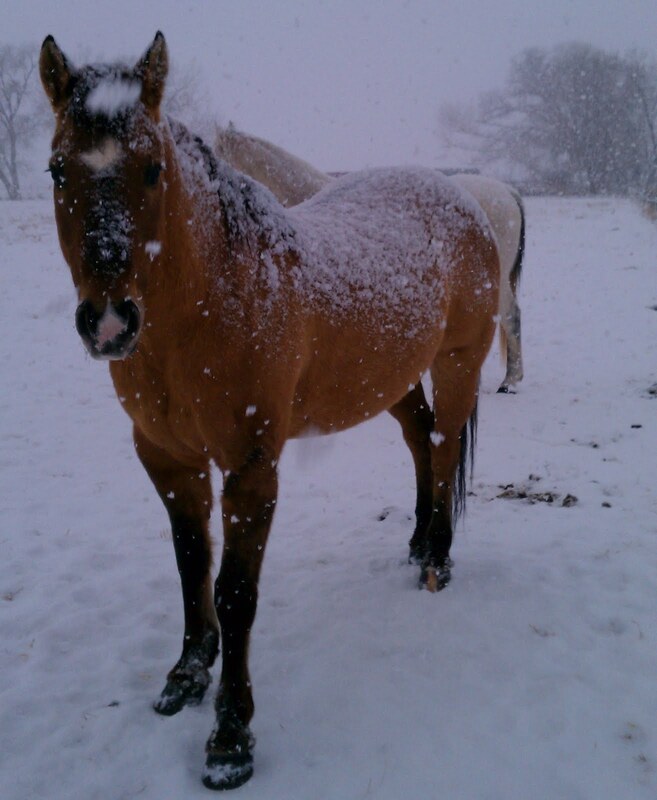 The horses actually seem to enjoy the snow and cold. They rarely bother getting in their barn. It's been very cold around here. For the next week, highs will be in the single digits, lows about negative 20 F. Brrr. We went cross country skiing last week on a sunny day at a little higher altitude. With an inversion (cold air sinks to the lowest point) going on in the Uinta Basin, the higher elevations are actually warmer. or the finches hanging out near the feeder. Sometimes the starlings crouch on the horses' backs, gathering a little warmth from thick fur and body heat. Pheasant have taken up residence along our creek this year. A colorful male makes the rounds beneath the bird feeder each morning, pecking at fallen seeds. Wisely, he stays outside Daisy's dog fence. No point in tempting fate. that's nice of Boss to share his warmth. It has been frigid in your neck of the woods. Hi Janie, It looks so cold there --but I would love it. We have that inversion here too sometimes.. The valley below will be a lower temp than us...Crazy.. Your birdies love the feeders also---especially this time of year, don't they? I love your snowy landscape, but I'm not sure I would be as happy about the snow as Boss seems to be. I know I would not enjoy those temperatures! Beautiful wintery shots! Love the first snowy horse scene...all the animals and birds are so good to see in the snow. The pheasant is a great capture! Gorgeous winter scenes, which you know I'd rather look at from some where warm. Does Daisy ride on your skies? I'm happy to be south and warm but I do enjoy seeing your lovely wintertime pica.. Thanks for sharing the beauty, Janie. Beautiful wintry shots! It seems our weather has flip-flopped - you're getting our typical January weather and we've had two days of almost 60 degrees. I know we have pheasant in our state but I haven't seen them in so long. It's a treat to see this one on your blog. Oh my goodness such beautiful pictures! What a gorgeous place! Too cold for me but I enjoyed looking at the pictures from my warm study. Nice that you said the horses enjoy the cold although I do not understand how. Janie, I liked seeing your snow! We are also having bitter cold and not enough snow to make a difference. The photos of the birds are all wonderful, but I especially love the one of them taking a ride on Boss. Looks like scenes out of Alaska :) Lovely pics of starlings & finches. It looks like a good time to chill. Great pictures. I love the one of the pheasant especially. Its always amazing to me that some critters can survive such bitter temperatures. Look at all those cute birds; love them! I'm glad to know the horses enjoy the cold weather, because you have plenty of it. Stay warm and keep the lovely photos coming. It has never occurred to me that a pheasant might visit a bird feeder but hey! Why not? Minus 20 sounds cold to me. So far, we have had a mild winter. I'm not sure that's a good thing but at least I feel like it hiking and birding. That pheasant is gorgeous. It seems crazy that the horses aren't even phased by such low temps. I thought it was cold over here but geez...-20 is just ridiculous. Its been some time I have been here..and I missed the snow...!! here in my bity, we are complaining coz its reached 0.9 degrees celsius and you guys are up n running in this snow!!!!! Nice pheasant! and look at those icicles! gee i thought our -7 was cold. our horses sure seem to prefer the cold to the heat and bugs. Great snow photos Janie. I love all of them but Snow Boss is adorable. Have a great week! Some lovely pictures of a snowy day. I am so jealous that you have a pheasant as a yard bird. The most exciting thing we've had is a kestrel. I love the birds on the horse. Pheasants are so beautiful. I used to raise them years ago. While your photos are beautiful I'm about sick of snow and I still have months to go! Though I look forward to spring, letting go of winter is a little like leaving a familiar place you love.